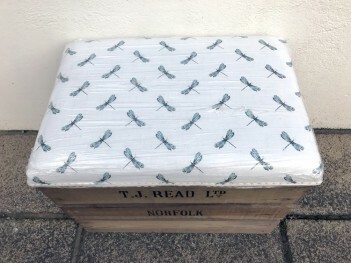 These boxes are handmade by Tiffany Jayne from Norfolk. She gets the boxes made for her, but professionally upholsters the lids herself and the fabric designs are hers in collaboration with a couple of artists. They are very comfy to sit on, well made and provide excellent storage. The stag fabric has changed recently with the new design shown in the photo. Single Elevated Box £145, width is 55cm, height 43cm and depth 37cm. Please click on the photos to see alternative images and designs. We are currently sold out of this size stool however, if you purchase one we will order it for you from the maker, this usually takes a couple of weeks.